Our Competition Economics team is led by Dr Paula Ramada, who is a Partner at London Economics. Paula has in-depth experience in the delivery of competition analysis work to public and private sector clients across multiple areas of competition economics. She has worked extensively on competition, pricing and regulation issues applied to practical economic problems in a number of different sectors. She also has considerable expertise in advising on the commercial and economic impacts of policy developments. At London Economics, Paula has nine years of experience of managing and directing projects for both private and public clients. 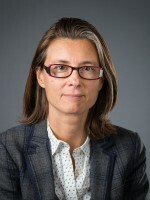 Prior to joining London Economics, she was a faculty member at Northwestern University and at the London Business School. Dr Paula Ramada has a doctorate in Economics from the Massachusetts Institute of Technology and an undergraduate degree in economics from Nova University of Lisbon.